Temperature: Nice in early AM, warm 92° by mid-afternoon. 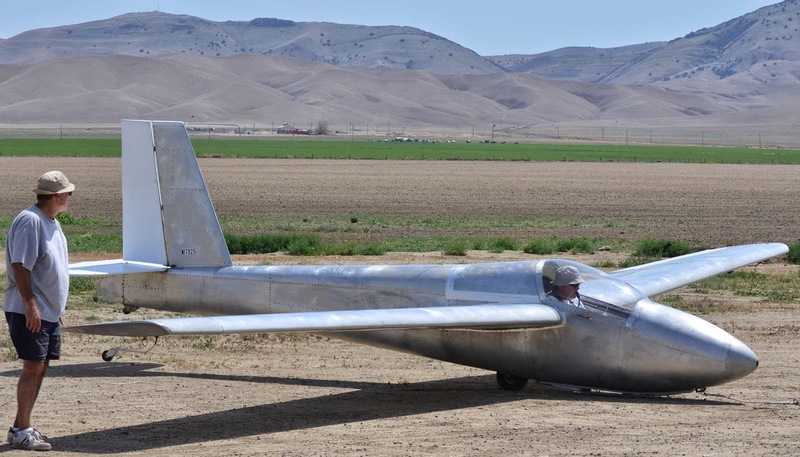 Tow pilot: Andrew Ouellet, 13 tows, & Peter Mersino, 7 tows. The 1-26 needed it Annual Inspection, so Jan Zanutto, Martin Caskey and Jim Rickey met at 8:00 AM to get that task completed. Jan was the Chief, Martin the very capable assistant, and Jim was the go-fer. 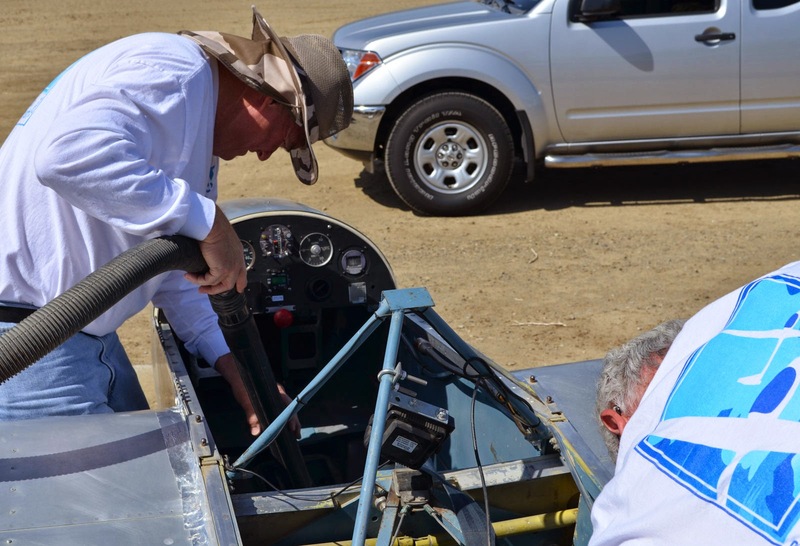 Martin Caskey and Jan Zanutto attend to the Annual Inspections of the 1-26. Martin vacuums out accumulated dirt while Richard Walker uses a brush to loosen up the more stubborn "Avenal Brown." There is some lift in spots. 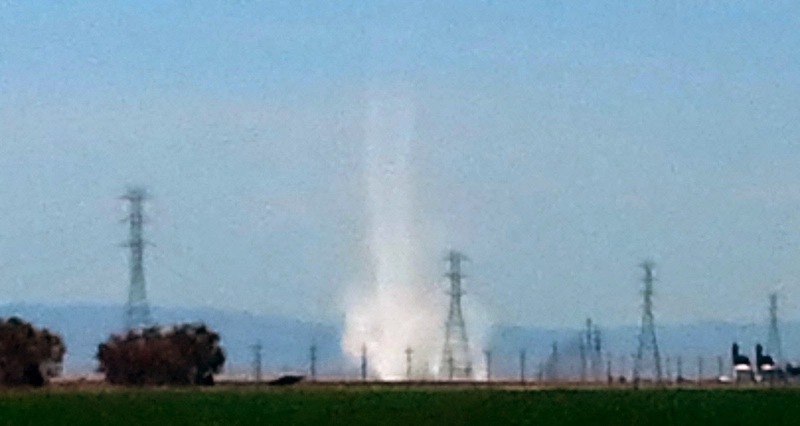 At 1:00 PM, on his way home after doing the annual on the 1-26, Jan Zanutto takes this picture of of a water spout that has formed over an open ponding area near the Avenal Cutoff & Highway 198. 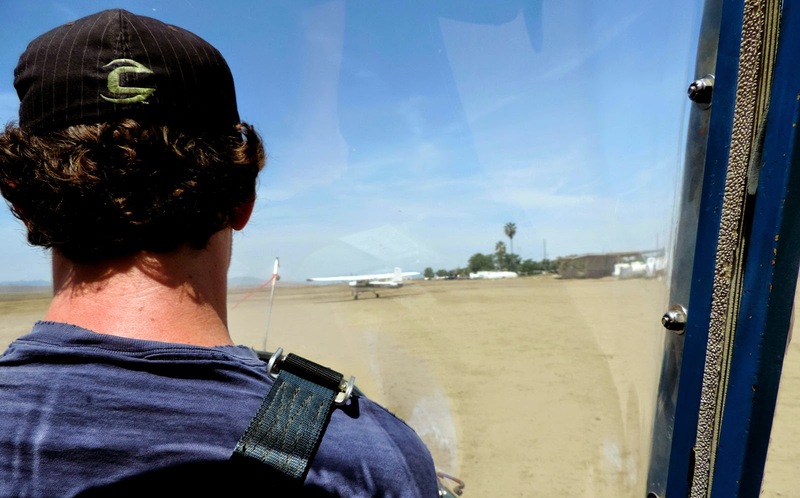 Taking a break from towing, Andrew Ouellet practiced for his checkride, which should be the first week of June. Too many other events occur between now and then, otherwise we'd have scheduled it sooner. He boxed the wake in quite turbulent conditions and managed a satisfactory performance. 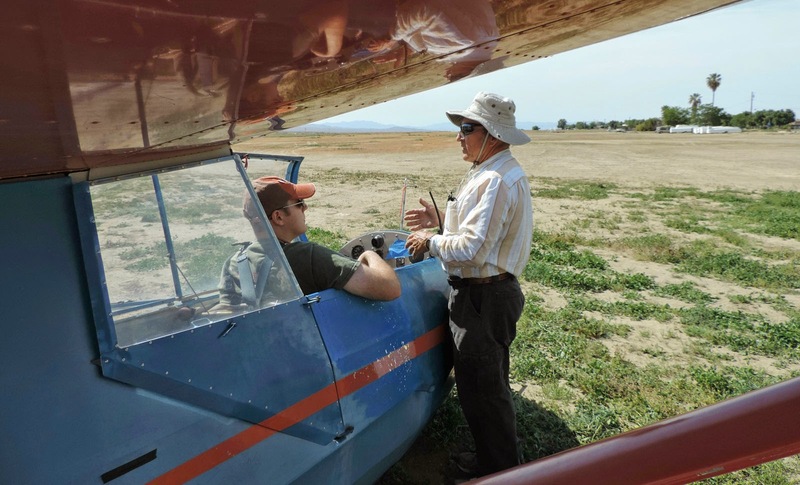 While Andrew was up in Orange Crush, Peter Mersino took over in 05U for Andrew while he practiced for his checkride. Thanks, Peter! 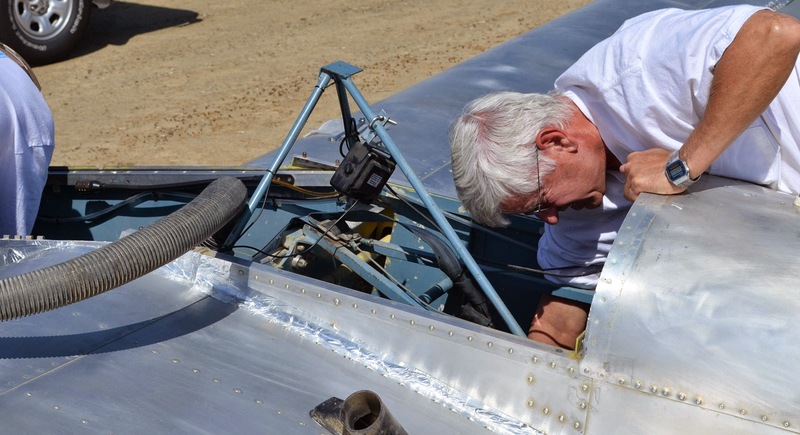 The rest of the time, Andrew did a fine job in the towplane for most of the day's towing. 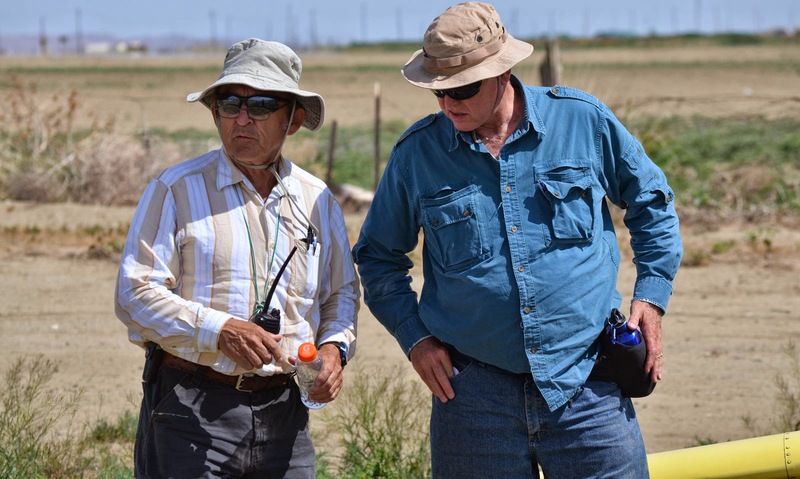 Below, Harold Gallgher briefs new student Edo McGowan, a Carpenteria resident that Harold says has, "more qualifications after his name than I can count." Edo arrived today ready to move forward towards his license. 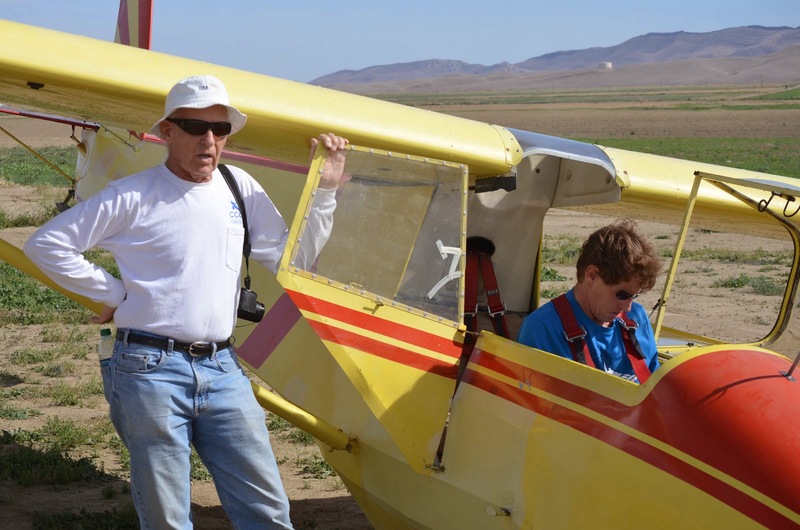 He will get his glider license and then work with young people out of Santa Ynez. 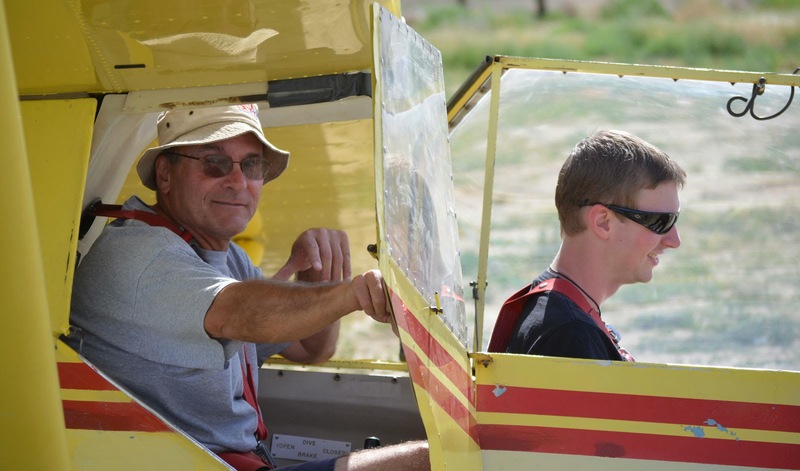 He did very well today, especially on his first flight where he gained 1500 feet of altitude in a short time. 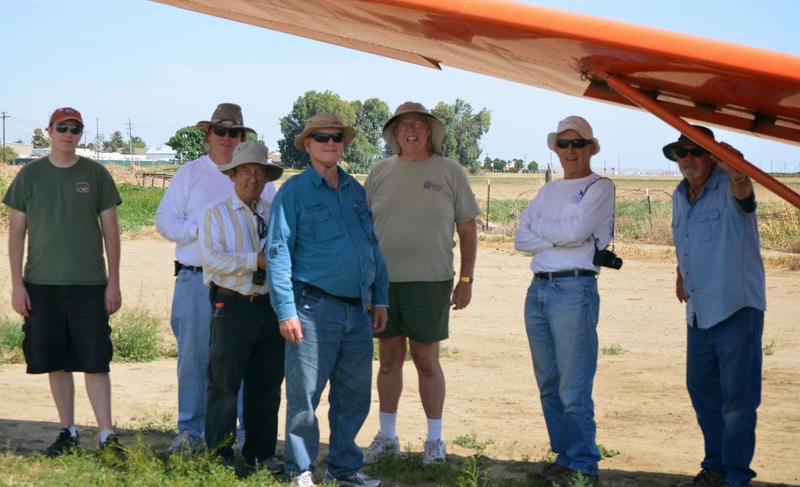 "We must have been in a 10- knot thermal because we went for 2600 msl to 4100 msl quickly, in the Orange Crush, without the benefit of a variomenter." Welcome to our club, EDO! 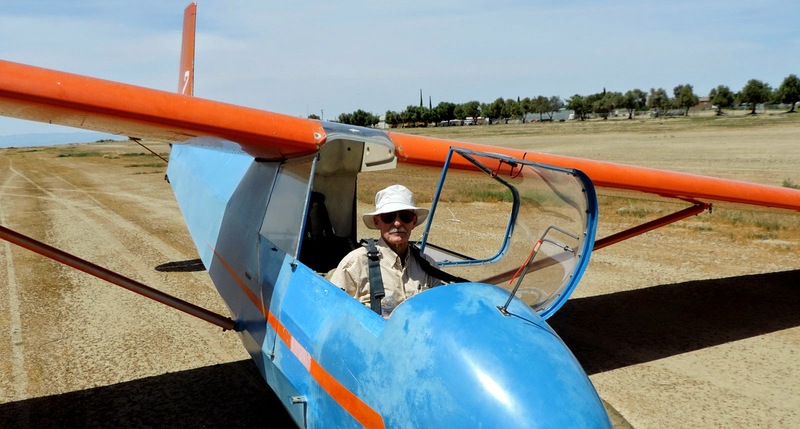 Alex; "I then flew with John Harbick. We did two practice rope breaks from 500ft. 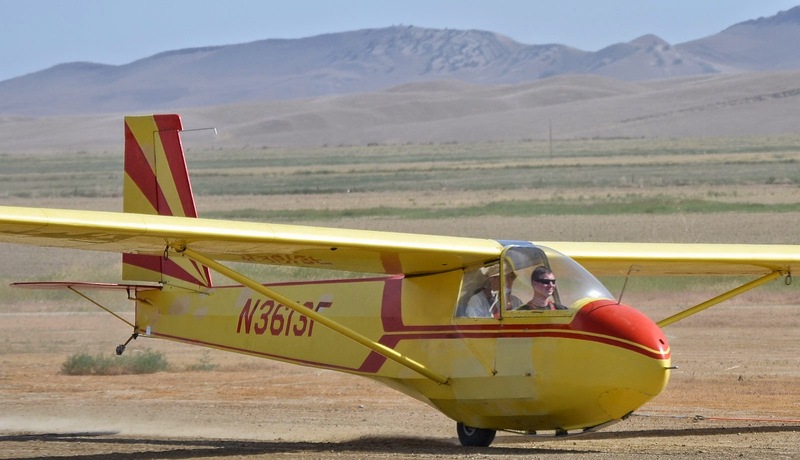 We also had one soaring flight in Big Bird and climbed up from a 2000ft tow and did maneuvers practicing for his upcoming private practical test with Dan Gudgel later this month." 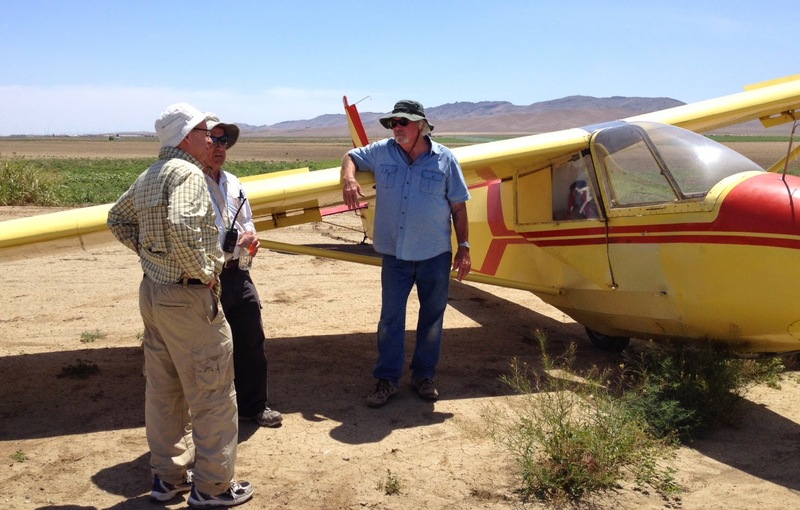 Ethan talks with Alex Caldwell and John Harbick before their flight. Andy Reistetter talks with Richard Walker who is waiting his turn in the launch queue. Martin Caskey must not have seen anything he did not like when doing the Annual Inspection on the 1-26. John Harbick is keeping him company while Martin is waiting in the queue. Larry Johnson is ready to run the wing for Martin. The sky had some nice white at times throughout the day. 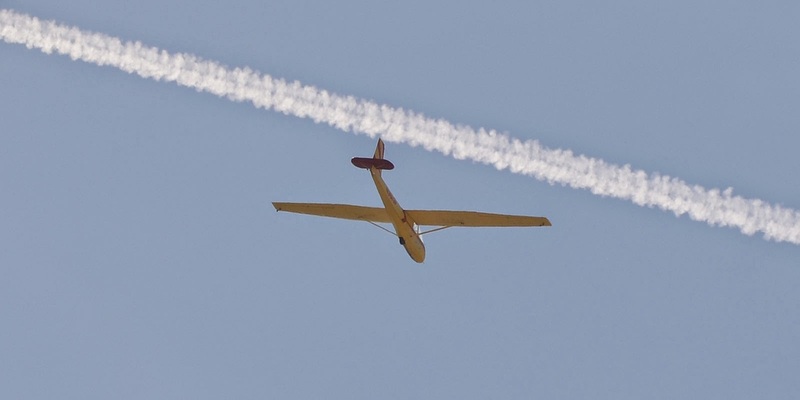 Alex and Craig in Big Bird pass under a contrail left by an airliner. Alex; "Graig Gifford made 4 flights and boxed the wake very well. He also practiced low tow and slack line procedures. He then had a 200ft practice rope break, and one 500ft practice rope break with a landing on runway 7. On our final flight, we got up to 6 knot lift and climbed to about 4800ft. 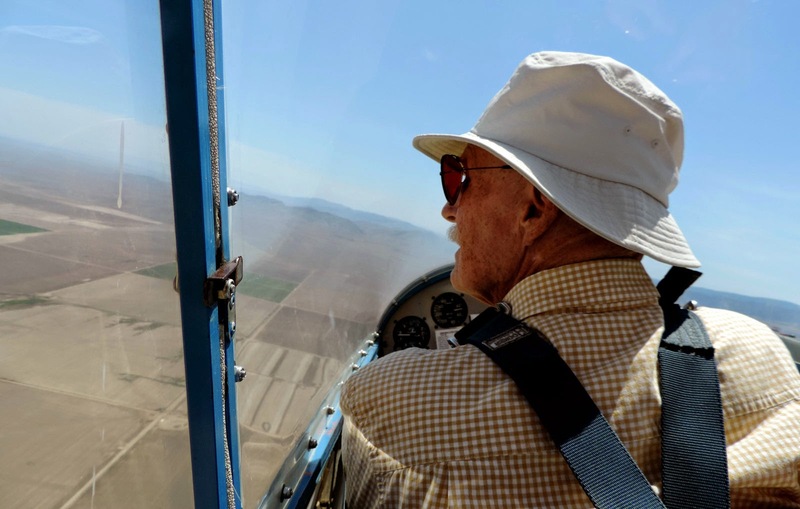 in Big Bird before landing and turning the glider over to Larry Johnson who gave rides to his daughter and her boyfriend." 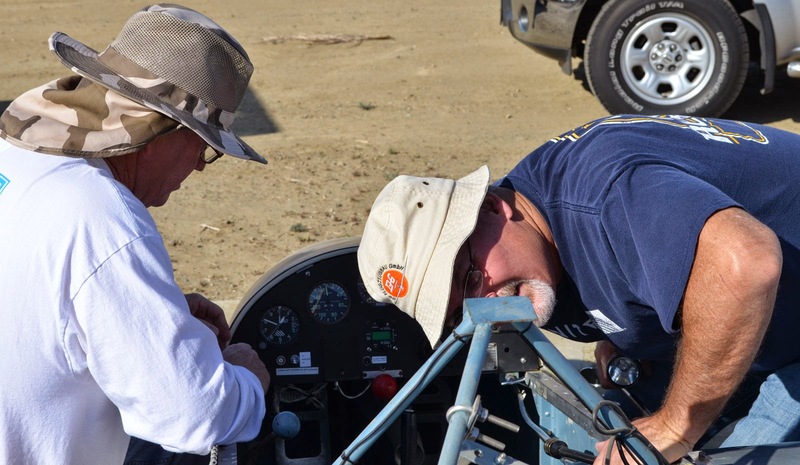 Alex Caldwell and Craig Gifford debrief after their flights. Larry Johnson gave a ride to both his daughter and her boyfriend today. Larry sure looks like he is a happy and proud dad. Her boyfriend looks on while Larry takes his daughter up first. Larry and his daughter's boyfriend ready for tow. At the warmest part of the day, finding shade became very desirable. Orange Crush got a new nickname, "Orange Shade." Shortly after these two pictures were taken, Alex and Jesse take Orange Crush aloft, but in couple of minutes Big Bird lands, is retrieved, and is nicknamed, "Yellow Shade." 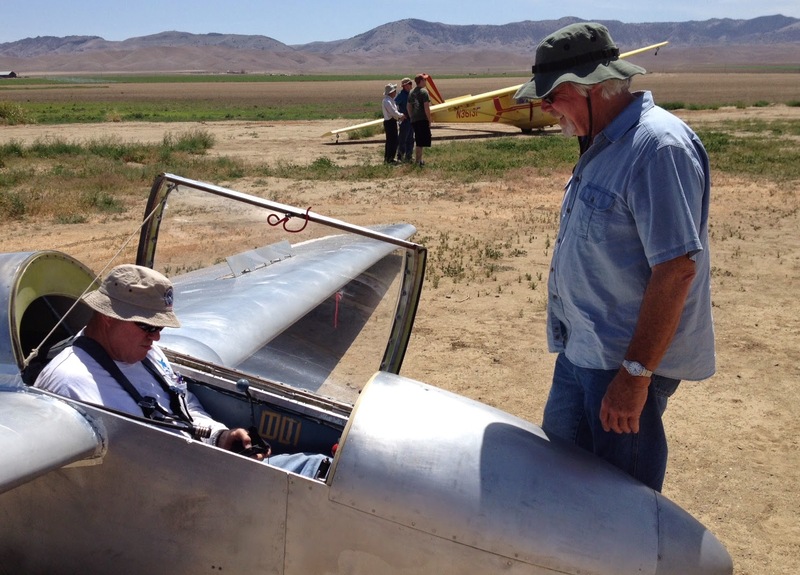 While the gang above enjoys the shade, Steven Kane sits in the 1-26 ready to get towed aloft. 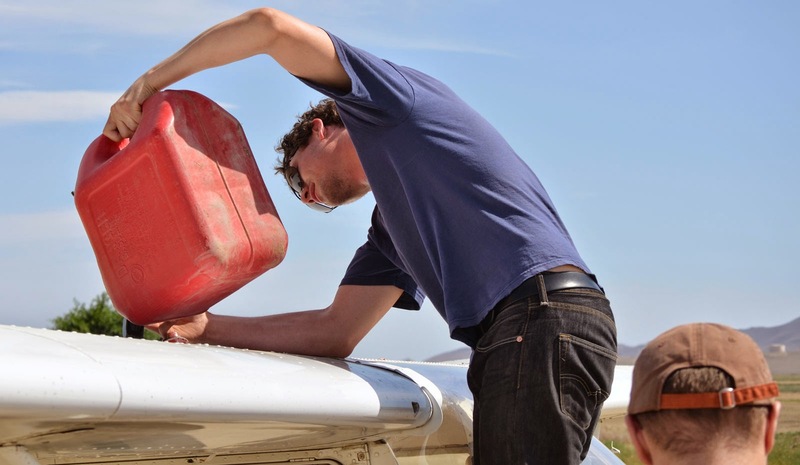 This picture was snapped at 3:37 PM, and I am sure Steven is ready to get some air flowing through the cockpit. 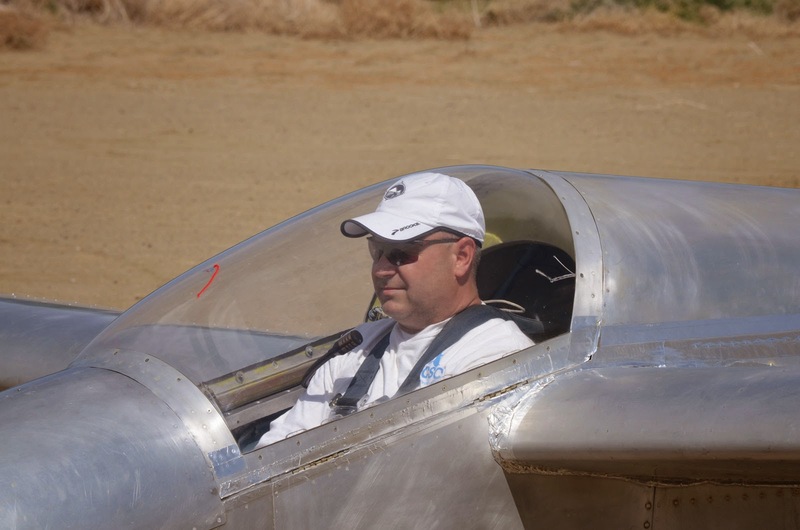 Alex; "I flew with new member Jesse Whallon, who is an instructor in the electronics and avionics area at Lemoore on the F-18. 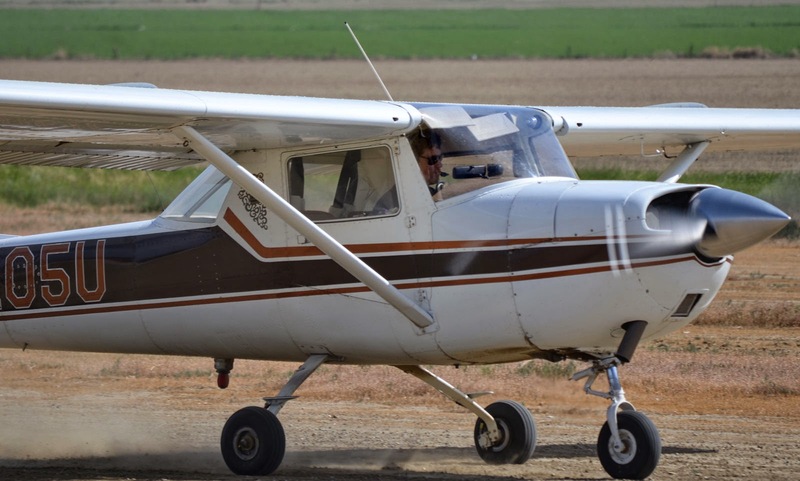 Jesse made two flights and did very well with the pattern and landing and using the spoilers and is starting to pick up the towing tricks as well. We are really happy to have him as a member of our club!" Alex, Jesse, and Craig's eyes are all on landing traffic. 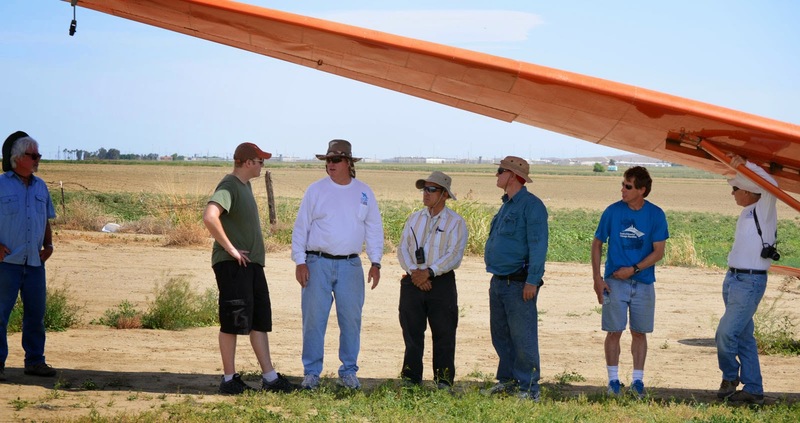 Alex says Jesse is doing quite well on his training and soon we'll add another successful glider pilot form Lemoore to our rolls. 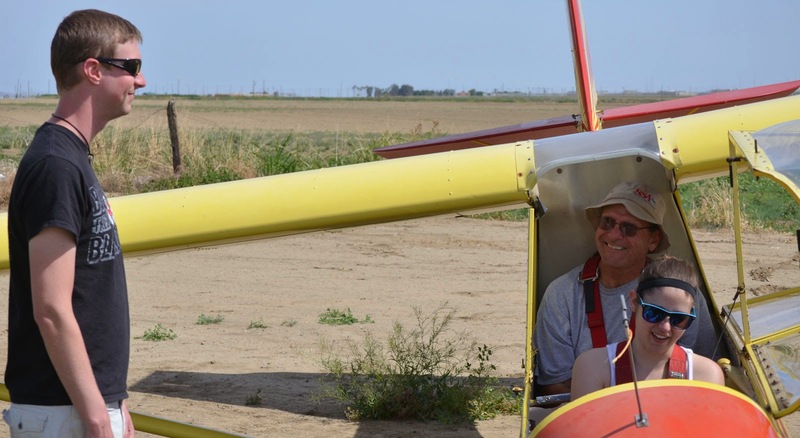 Peter Mersino continues his quest for his glider add-on rating, and Harold says he is, "sure that one day soon he'll get that coveted license." Harold Gallagher ready to go up with Peter Mersino. I want to thank Steven Kane for pictures, Harold Gallagher for text and pictures, and Alex Caldwell for text, in their contributions to today's blog.